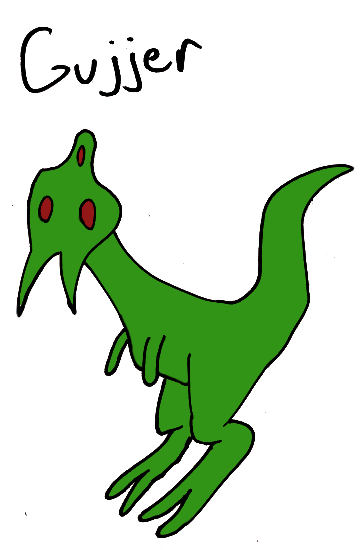 On the alien world Thrensa the most intelligent species is one for whom technology has not advanced very far. The Thrensans, as they are known, are nomadic beings who run on the vast plains of the world not unlike Earth’s antelopes. Gujjer is the leader of her tribe, having risen to dominance with her mystical knowledge. Being bonded to the spirits of her ancestors, Gujjer can get visions from the sky that allow her to predict the weather and judge where best to bring the group. But will even this knowledge help Gujjer to save her tribe when the undead start to rise and eat the flesh of living Thrensans? Gujjer and friends are going to have to find out. I had done all kinds of alien wizards this year, but they were all Wallfixers. 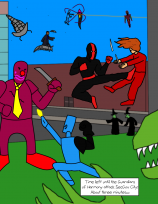 Obviously I had to remedy that by making an alien wizard unaligned to them. I am clearly doing important work here. There was a crimeboss wizard who, as wizards sometimes do, surrounded himself with animated objects to do his work for him. Among them was a walking talking cabinet that wanted more. After only a short time serving his “master”, the Cabinet strangled the wizard to death and took over the crime syndicate. Ruling from the shadows, the Cabinet has become a criminal mastermind, owing to the fact that any books or maps or files he keeps in his drawers, he automatically knows the information they contain. This makes planning jobs and running operations second nature to him. It also means that, once you’ve gotten into his bad books, he won’t forget you. 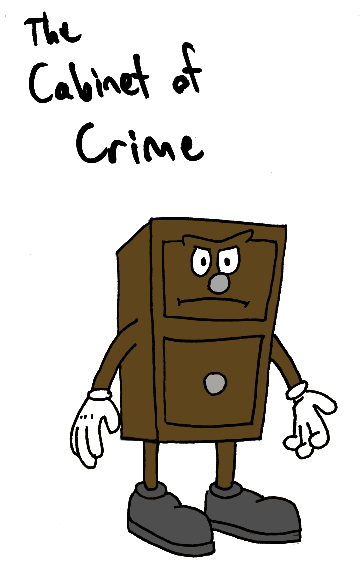 I thought it would be amusing if some hero was chasing after clues to find out who the Cabinet of Crime was, thinking it was an organizational body, and then this guy turned up. It’s so stupid, it appeals to me greatly. Of course, since I’ve blown the twist here, I can’t do it now. I’m sure we all agree that’s for the best. The Cabinet of Crime looks like the sort of thing people would laugh at just before he kills them in a murderous rage. Yeah, I need to figure out how to get Pesci to do the voice.